If You Were A Zombie Gift Item What Would You Be? Alright all you crazy Zombie fans!!! We're in the works for another awesome contest here at BestZombieGifts.com but we need your help. 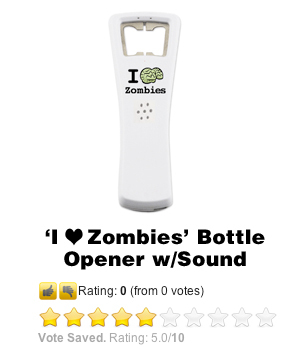 We have all these ideas for cool promotional zombie items swirling in our brainsss that we need your feedback on. Take a few minutes and let us know what's your favorite, or even your least favorite for that matter. Your honest, unbiased feedback is appreciated - and definitely needed. You can star rank them, give em' a thumbs up or thumbs down, or drop a comment. If you think a certain item is terrible just let us know. We'll get over it through many years of therapy. Hey, we know what you're thinking... What do I get out of it? Why would I offer my amazing opinion? Why would I want to check out your awesome zombie gift ideas and then give my valuable feedback? 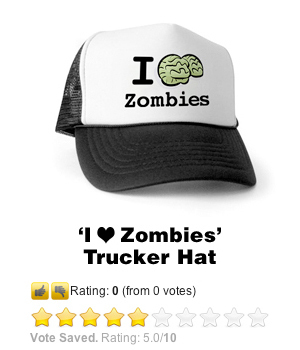 Well, how about we choose a random commenter weekly and give them one of our best zombie gifts. We've got three The Walking Dead Vinyl Collector Items just ready to be sent your way. So check out some zombie gift items listed below. Drop yourself a comment (or five). And who knows - maybe you'll be the lucky one who gets your very own Daryl Dixon, Rick Grimes, or Bicycle Girl Zombie collector item. Remember, the more comments you give the more chances you'll have to win so why not give some feedback on all of them. Check Out All Our Zombie Gift Ideas Below!